Keith Felder by hand carved dugout on Colyell Bay, Livingston Parish, Louisiana. 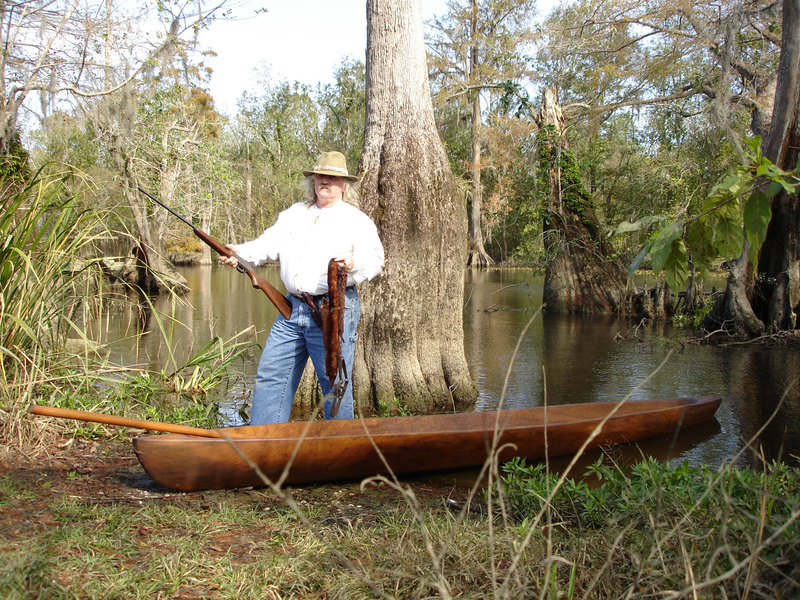 My name is Keith Felder and I build traditional wooden boats of south Louisiana – dugouts, pirogues, and Creole rowing skiffs. My material of choice is sinker cypress that I retrieve from the waterways of south Louisiana. I took classes at the Center for Traditional Boatbuilding at Nichols State University. I worked as an apprentice with the “master boatbuilders; Raymond Sedotal (swamp pirogues, lumberman’s pirogues, and Creole rowing skiffs), Rodney Cheramie (marsh pirogues and Lafitte skiffs), Wenshelaus Billiott, a Biloxi Chitimacha Indian (round bottomed pirogues), and Tom Colvin (lake skiffs). I take pride in my talents as a wooden boat builder. I read the wood to produce curves that enhance the beauty of the boat. I have the eye and skills to create beautiful, functional, traditional wooden boats of south Louisiana.